Our Arena Build Department has been very busy working on our practice arena. They have learned about reading scaled drawings using a caliper to get the proper cuts and basic gluing and reinforcing techniques that go along with wood construction. They are very excited to have two mentors at their disposal this year. 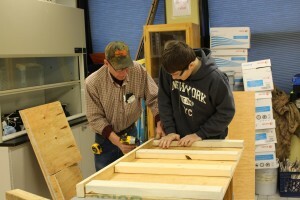 Elroy Aune is on his second year of mentoring our team and Gary Langaas has joined Team 5172 as a mentor this year. We are very excited to have them generously volunteering their time and sharing their knowledge with our team. The Junkyard Robot Department started their brainstorming sessions with Debra Aune, the GMR art teacher, last night after school. After only 45 minutes of time they have an IDEA!! They are now onto collection of JUNK! We will keep you updated in the next few weeks. 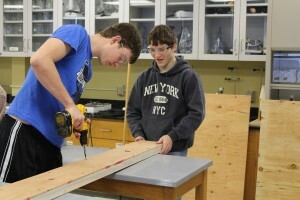 The Build Department continues to work at Hlucny Repair on the prototyping of the robot. They are making progress everyday and are getting close to a final design with final measurements. They have seen some new faces out there in recent days and are very excited about that. What is even better is the feeling that the kids are getting when they are out there. They come back to school and feel that there actually is a purpose for all the non-engineering things that they are doing. Ben Lieberg and Nick Kaml hard at work on the practice Arena.